I’ve felt since day one of designing The Forest Modern, that this home would open up to many friends and family. What’s the point of having a pretty home if you keep it all to yourself? Dream it. Build it. Then open the doors wide open to guests!!! We’ve already hosted friends and family in the very short amount of time we’ve lived in our new home. It doesn’t matter that we have empty rooms waiting for furniture or unpacked boxes shoved in the corners. 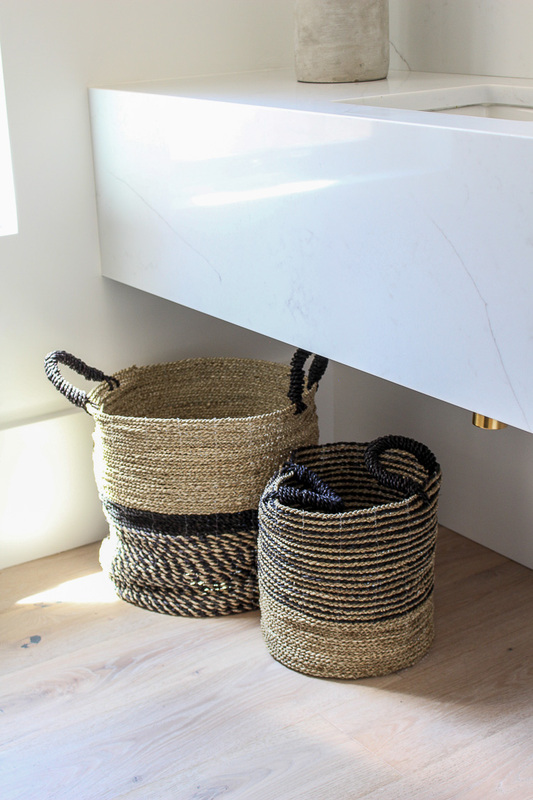 This home already has heart and I want my guests to feel special during the time spent here. 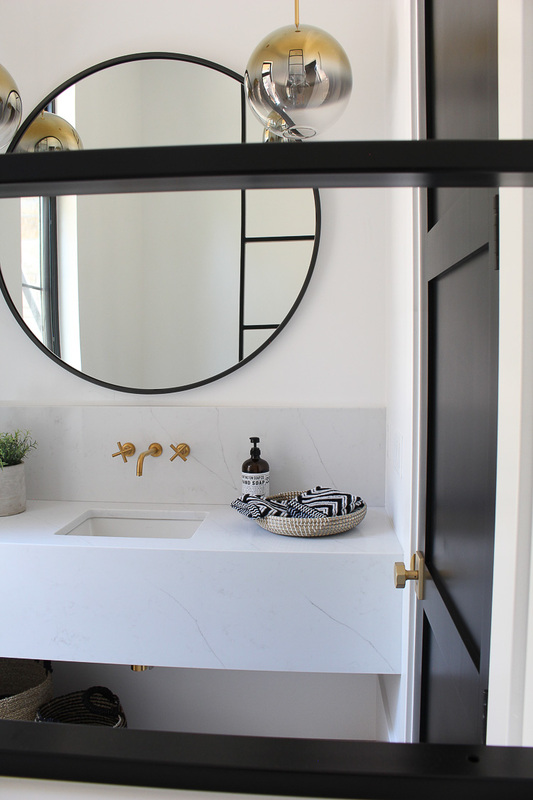 Typically, the first impression of a home is the front entry but I believe that the powder bathroom is the lasting impression. 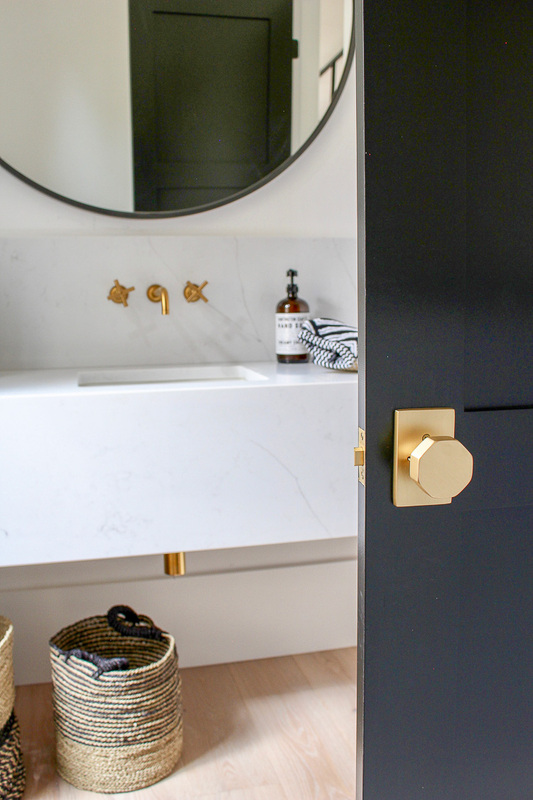 Guests most always will need to step into the powder bathroom so making it feel extra special or even a bit luxurious is a sure way to impress the guests and make them feel a bit pampered. 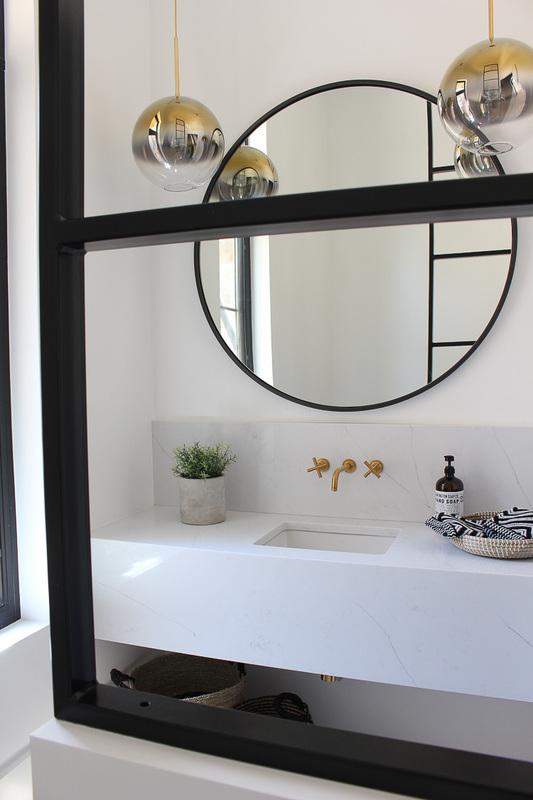 We actually have two powder bathrooms on our main level, but this one is right off our front entry and you’ll see how it was designed to flow with elements in the rest of the home. It’s posh and luxurious with an edge, actually a steel edge you’ll see soon. 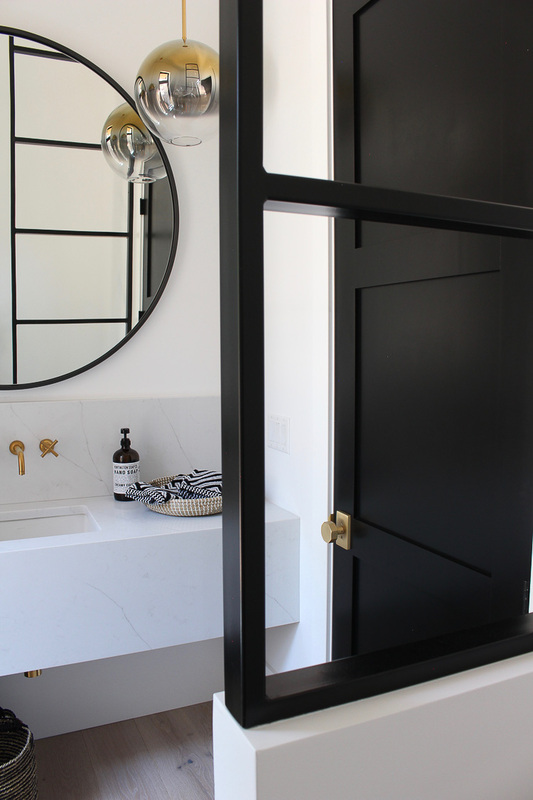 The first impression is the black door with this gorgeous hardware from Emtek. 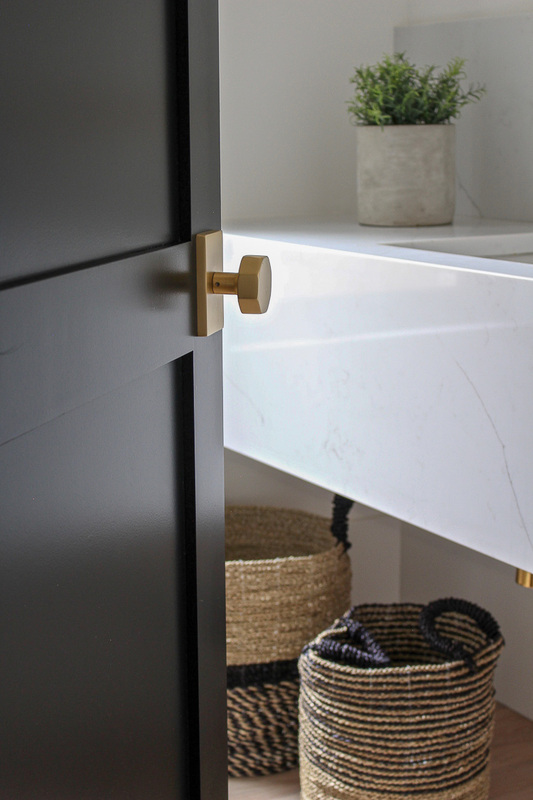 I used this hardware throughout the home and am completely obsessed with the satin brass finish and octagon shape. 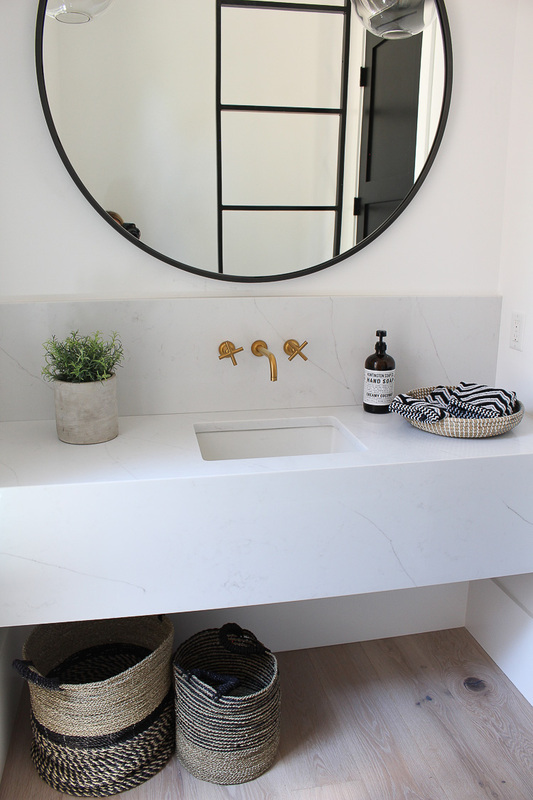 The floating vanity is made of Aurea Stone quartz, color is Paragon. 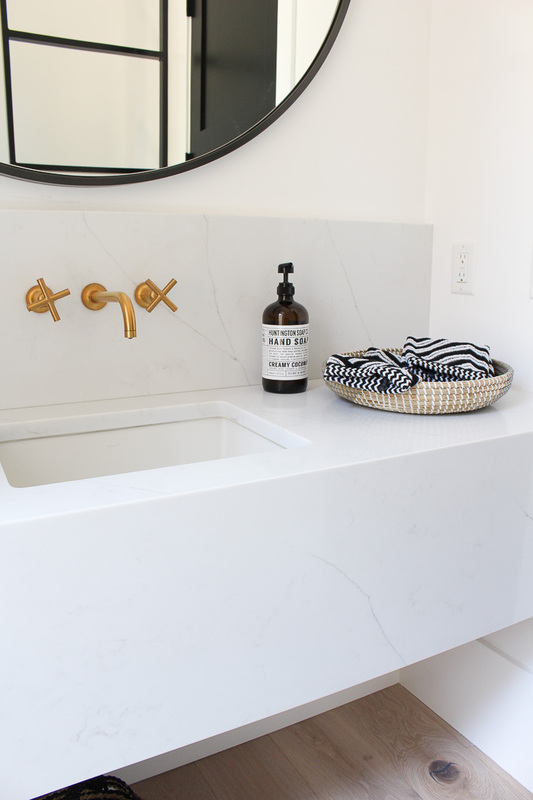 The same quartz as in our new kitchen. 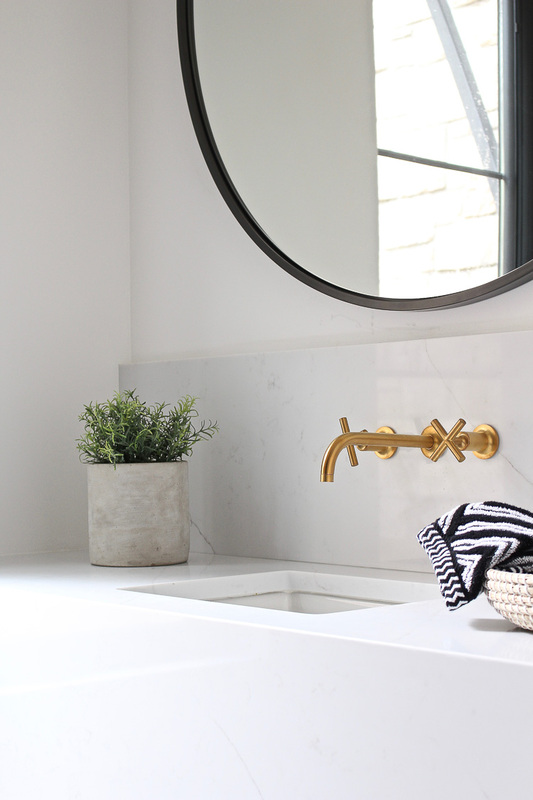 The gold wall mount faucet is one I’ve dreamed of having in a bathroom for years. 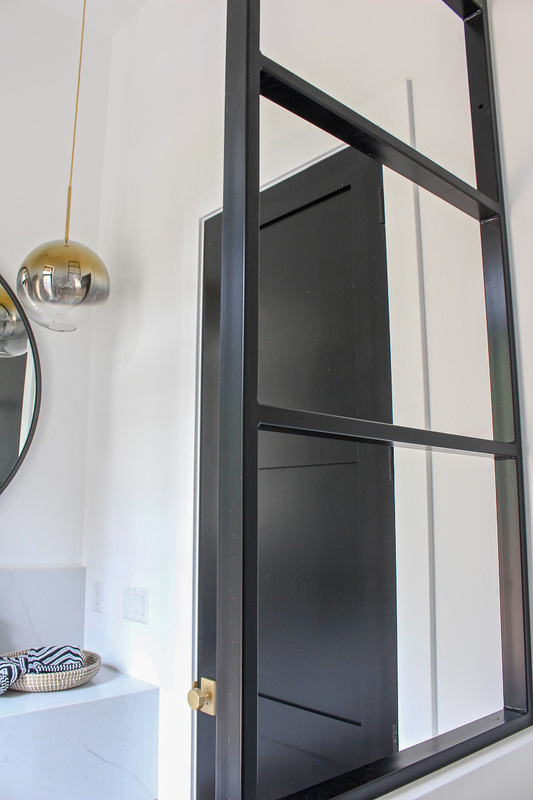 You’ll notice in the mirror the reflection of the steel room divider. 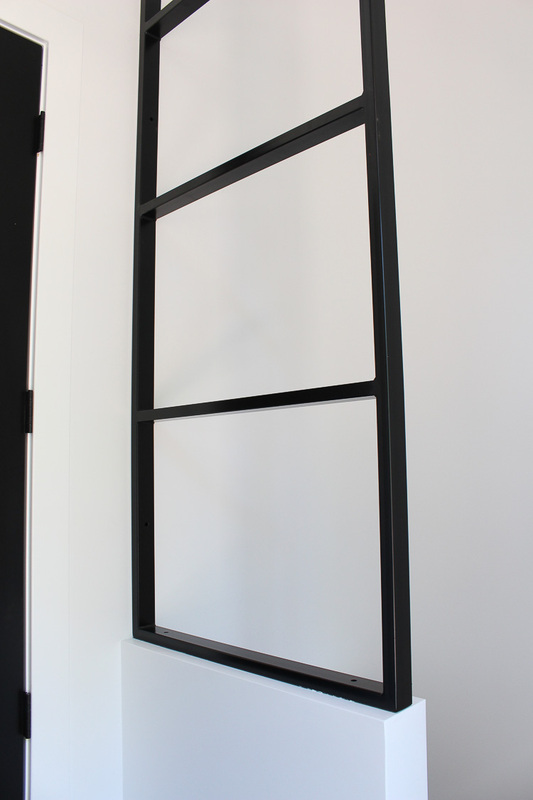 It matches the steel transoms that I had custom made in our kitchen and to be seen later in our living room. I wanted to divide the lavatory space with something of interest and more than just a pony wall. We have 12′ ceilings and after we had framed in the pony wall, it felt wimpy and needed more substance. 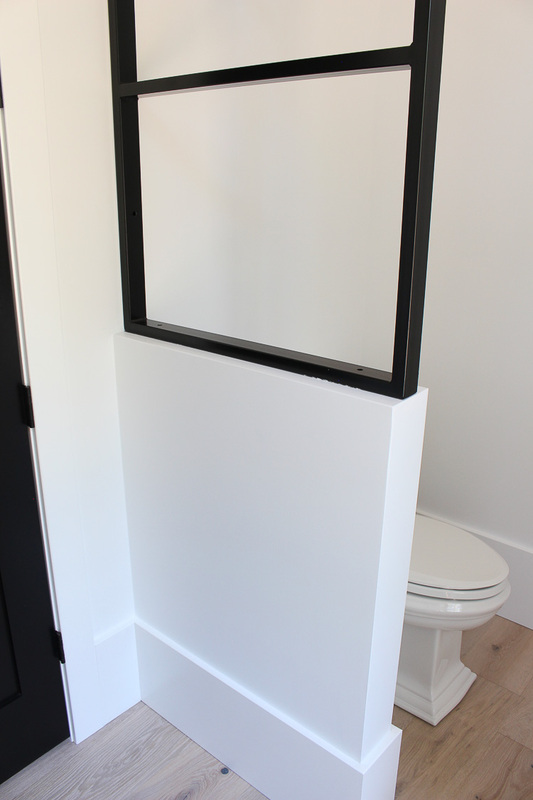 The steel divider was my perfect solution and it makes a huge impression in our powder bathroom. Kind of a challenge getting a good photo of this angle, but I wanted to share the space it defines. 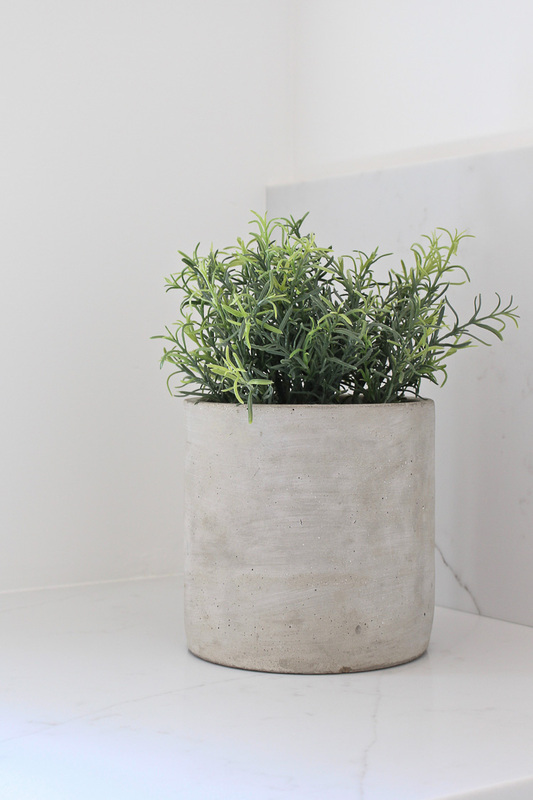 I’m obsessed with all things concrete lately, adding it to every room in some simple form like this little planter. It adds a raw, organic element that I’m craving in interiors and exteriors. If you have any questions about this space, be sure to leave a comment. I’m trying to cover all the basis as I reveal each room but want to help guide you along if I leave out a detail! As always, thanks for following along as we unveil our new home The Forest Modern! 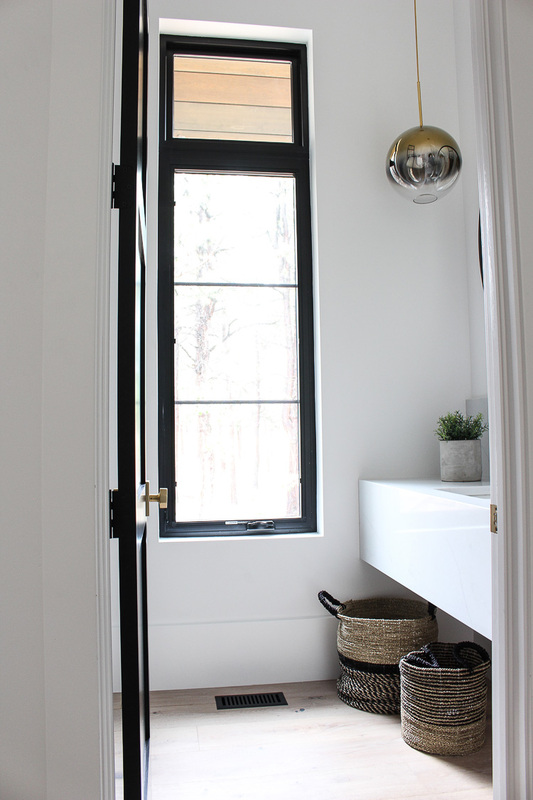 « The Forest Modern: Modern Vintage Master Bathroom Reveal! I love how you incorporated different elements to this room. Casual, sleek yet modernly sophisticated. 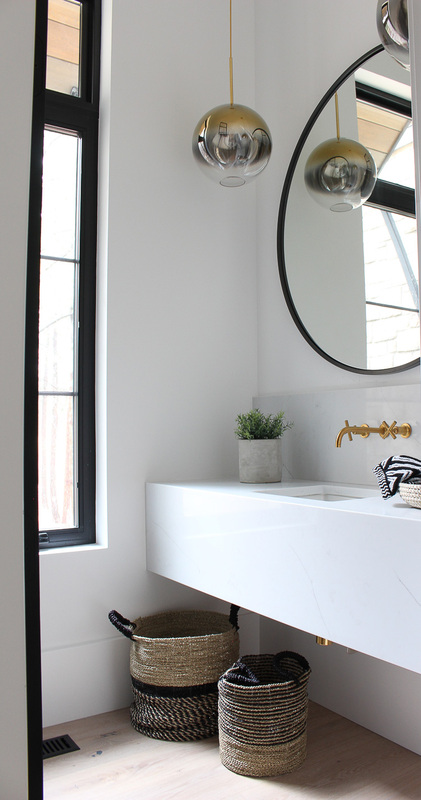 A powder room that you want to stay in a little longer! I Enjoy all your room reveal posts. Bellisima! 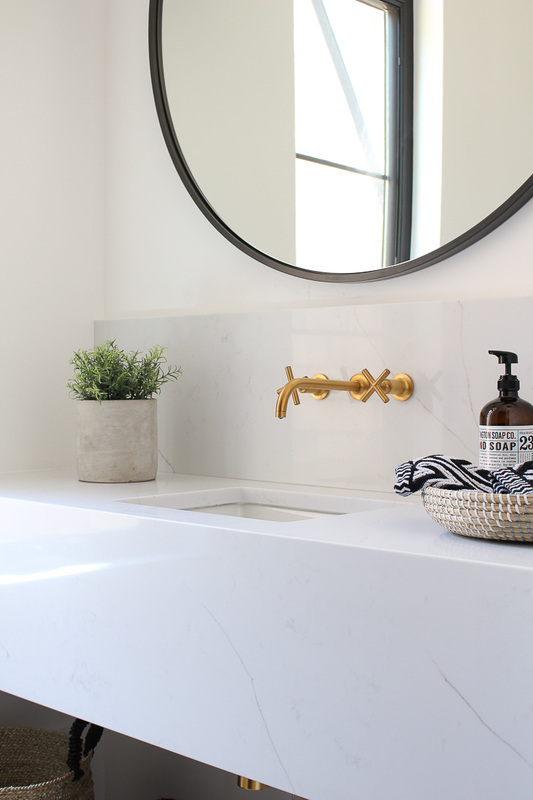 Thank you so much Roseann for your sweet compliments to our powder bath! You described it so beautifully! Thank you Bree! The steel transoms have had a domino effect in our home! Can’t get enough of them! There you go again with the great lighting! I love the whole space!!! Congrats on such a beautiful home! Thank you Heather!! Lighting is my favorite detail! It is stunning!!! The only question I have is regarding the lighting. 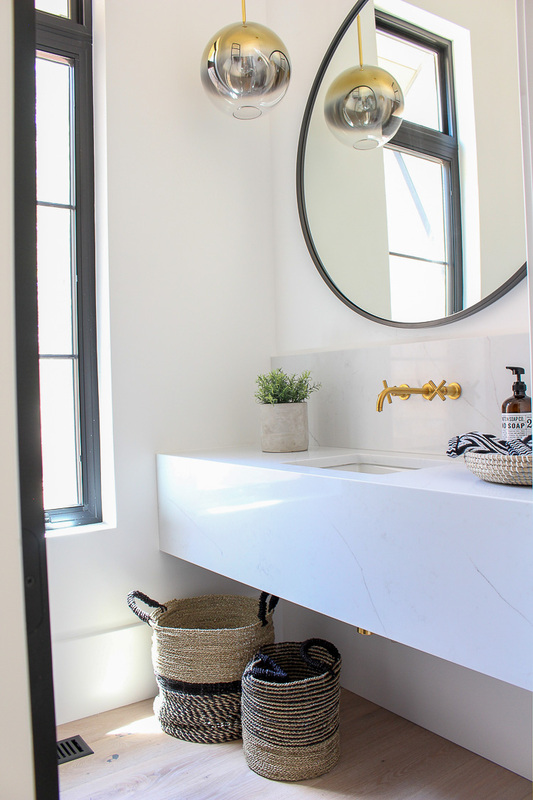 As beautiful as it is…how practical is it for a powder room when someone needs to adjust their makeup(?)🤔. Hi! We do have LED can lights in here as well if there is ever a need for more lighting. They’re on a separate light switch so mostly we always have just the pendants on. They actually give out quite a bit of light as well. Thanks for stopping by the blog! Thank you Marty! I appreciate you always leaving the sweetest comments! This bathroom is gorgeous. I love the simplicity of your design style along with unique items thrown in like the steel divider. What is the finish on your drywalls? Is it smooth throughout the house or is there some texture in it? Hi Cyndi, thank you for your sweet compliment! We have smooth skim coat texture on our walls and is the same throughout the home. Thanks for stopping by! Do you list paint colors somewhere? I love the white you used. Its warm but not yellow! Hi! Our interior white is Sherwin Williams Pure white. My favorite detail is how the first thing that someone sees entering the powder is a window and not the toilet or sink! Great design! Thank you! I did my best to hide the toilet…lol! Hi Carol! I really truly appreciate your thoughtful comment. You just made my day!! Thank you! I will always share my resources in my own home since my goal is to help others easily find great products for their own homes. Mixing high and low price items is my game and I am always on the hunt to get the highest end look on a budget. 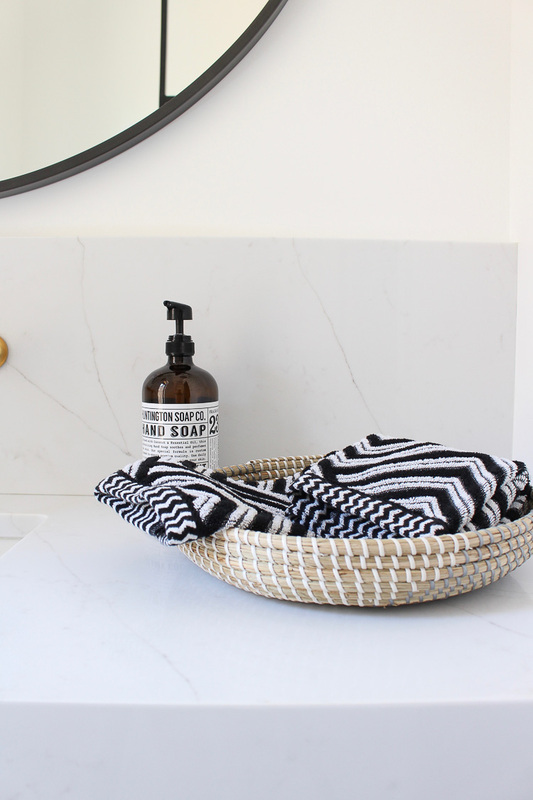 Sometimes, there is a splurge but more often than not I try to balance the budget with items that work great together and no one would know which one was more expensive than the other. Thanks for following along! This space is exactly what I would want. I am so obsessed with black and white. It is so classic and timeless. You did an amazing job. Can’t wait to see more as you continue to reveal it all. Hi Jenn! I agree with black and white! So timeless yet easy to add other colors to whenever you want! Thanks so much for your compliment and for following along with the design journey. 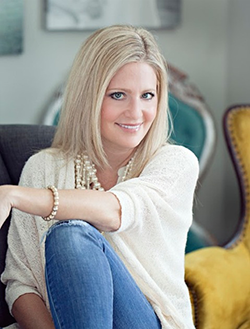 Just discovered your blog, – absolutely beautiful home Shauna! 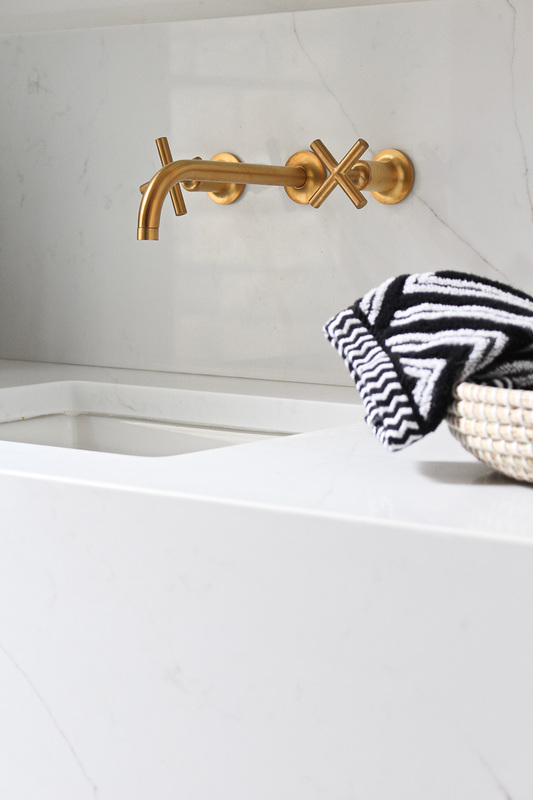 The quartz vanity in your powder room, I love it. Was it custom built? Hi Donna! So happy you found the blog and love what you see! 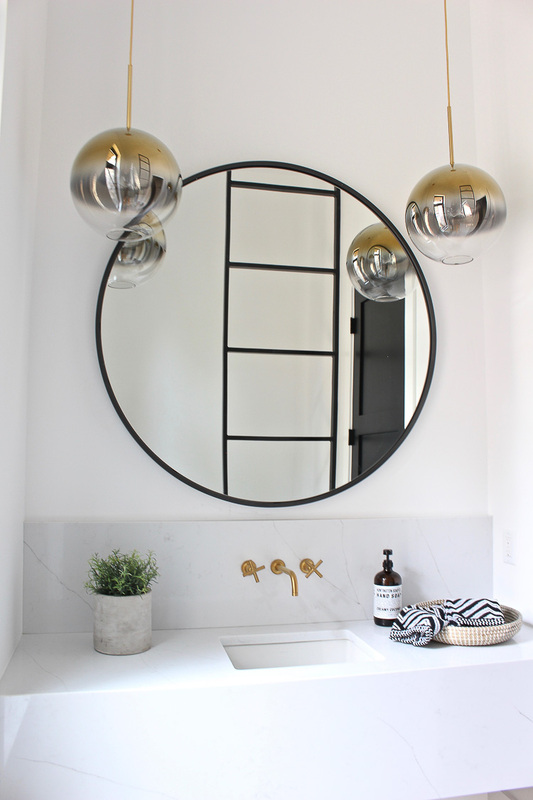 The vanity was custom built in our powder bath. My carpenter basically built a box out of 2 x 4’s and the quartz was adhered to it. Love how it turned out! Hi Kathryn! Brass is back and in a GOOD way!! Your mom knew best! lol! Thank you for leaving a comment and showing love for our home!